forward currency exchange contracts represents the measurement of the contracts at month-end spot rates as adjusted by current forward points. Cash Flow Hedges We use a layered hedging program to hedge select anticipated foreign currency cash flows to reduce volatility in both cash flows and reported earnings. These foreign exchange contracts generally have maturities up to eighteen months. For derivative instruments that are designated and qualify as a cash flow hedge, the effective portion of the gain or loss on the derivative is reported as a component of AOCI and reclassified into other income (expense) or cost of sales within earnings in the same period during which the hedged transaction affects earnings. In 2013 a gain of $9 was reclassified from AOCI to earnings relating to the discontinuance of certain cash flow hedges, as we considered it probable that the original forecasted transactions would not occur. Cash flows associated with these hedges are included in cash from operations in the same category as the cash flows from the items being hedged. The gross notional, maximum term and gross fair value amounts of foreign exchange forward contract derivatives designated and non-designated as hedging instruments are: Designated Non- Designated Total December 31, 2014 Gross Notional Amount $ 357 $ 2,085 $ 2,442 Maximum term in days 546 Fair Value Other Current Assets $ 18 $ 12 $ 30 Other Noncurrent Assets 2 — 2 Other Current Liabilities — 12 12 $ 20 $ — $ 20 December 31, 2013 Gross Notional Amount $ 344 $ 2,000 $ 2,344 Maximum term in days 546 Fair Value Other Current Assets $ 11 $ 10 $ 21 Other Noncurrent Assets 1 3 4 Other Current Liabilities 1 1 2 $ 11 $ 12 $ 23 We are exposed to credit loss in the event of nonperformance by counterparties on our outstanding forward currency exchange contracts but do not anticipate nonperformance by any of our counterparties. Should a counterparty default, our maximum exposure to loss is the asset balance of the instrument. Recognized foreign currency transaction gains (losses) included in earnings were: Recorded In: 2014 2013 2012 Cost of goods sold $ 1 $ — $ — Other income (expense) (8) 3 (7) Total $ (7) $ 3 $ (7) At December 31, 2014 and December 31, 2013, pretax gains on derivatives designated as hedges of $15 and $12, which are recorded in AOCI, are expected to be reclassified to earnings during the next 12 months. This reclassification is primarily due to the sale of inventory that includes previously hedged purchases. Fair Value Hedges Interest rate derivative instruments designated as fair value hedges are being used to manage the exposure to interest rate movements and to reduce borrowing costs by converting fixed-rate debt into floating-rate debt. Under these agreements, we agree to exchange, at specified intervals, the difference between fixed and floating interest amounts calculated by reference to an agreed-upon notional principal amount. At December 31, 2014, we had interest rate swaps in gross notional amounts of $500 designated as fair value hedges of underlying fixed rate obligations representing a portion of our $600 senior unsecured notes due in 2024. The market value of outstanding interest rate swap agreements at December 31, 2014 was a recognized gain of $10 which is recorded in other long-term assets with an offsetting recognized loss of $10 on the fair value of the underlying fixed rate obligation recorded in long-term debt in the consolidated balance sheet. No hedge ineffectiveness was recorded as a result of these fair value hedges in 2014. 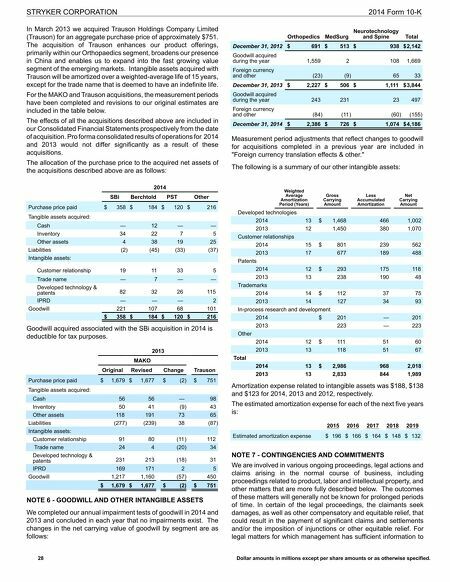 STRYKER CORPORATION 2014 Form 10-K 27 Dollar amounts in millions except per share amounts or as otherwise specified. 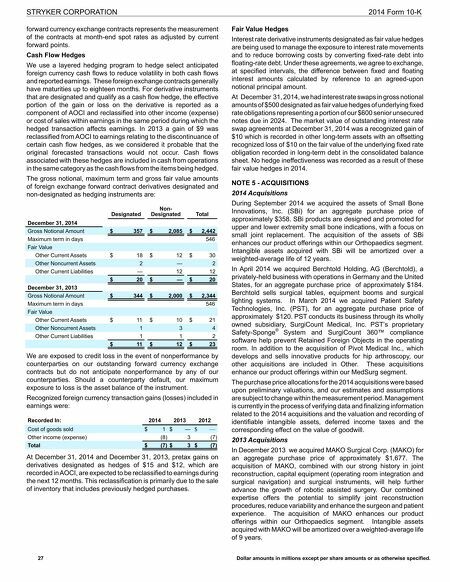 NOTE 5 - ACQUISITIONS 2014 Acquisitions During September 2014 we acquired the assets of Small Bone Innovations, Inc. (SBi) for an aggregate purchase price of approximately $358. SBi products are designed and promoted for upper and lower extremity small bone indications, with a focus on small joint replacement. The acquisition of the assets of SBi enhances our product offerings within our Orthopaedics segment. Intangible assets acquired with SBi will be amortized over a weighted-average life of 12 years. In April 2014 we acquired Berchtold Holding, AG (Berchtold), a privately-held business with operations in Germany and the United States, for an aggregate purchase price of approximately $184. Berchtold sells surgical tables, equipment booms and surgical lighting systems. In March 2014 we acquired Patient Safety Technologies, Inc. (PST), for an aggregate purchase price of approximately $120. PST conducts its business through its wholly owned subsidiary, SurgiCount Medical, Inc. PST's proprietary Safety-Sponge ® System and SurgiCount 360™ compliance software help prevent Retained Foreign Objects in the operating room. In addition to the acquisition of Pivot Medical Inc., which develops and sells innovative products for hip arthroscopy, our other acquisitions are included in Other. These acquisitions enhance our product offerings within our MedSurg segment. The purchase price allocations for the 2014 acquisitions were based upon preliminary valuations, and our estimates and assumptions are subject to change within the measurement period. Management is currently in the process of verifying data and finalizing information related to the 2014 acquisitions and the valuation and recording of identifiable intangible assets, deferred income taxes and the corresponding effect on the value of goodwill. 2013 Acquisitions In December 2013 we acquired MAKO Surgical Corp. (MAKO) for an aggregate purchase price of approximately $1,677. The acquisition of MAKO, combined with our strong history in joint reconstruction, capital equipment (operating room integration and surgical navigation) and surgical instruments, will help further advance the growth of robotic assisted surgery. Our combined expertise offers the potential to simplify joint reconstruction procedures, reduce variability and enhance the surgeon and patient experience. The acquisition of MAKO enhances our product offerings within our Orthopaedics segment. Intangible assets acquired with MAKO will be amortized over a weighted-average life of 9 years.